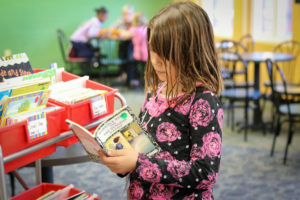 The Learning Center at Middletown serves students in the regular classroom program, grades 1st through 5th, who attend Middletown Elementary or Jane Hite Elementary. 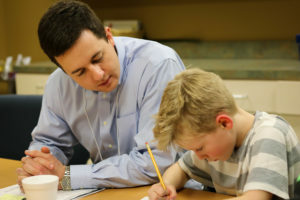 Volunteers (mentors) work one-on-one with students to develop a caring, supportive relationship while engaging in literacy activities (reading, writing, speaking, and listening). TLC begins in mid-September and continues through April. Students meet once a week from 4 to 6 p.m. Middletown Elementary students meet on Tuesdays. Jane Hite Elementary students meet on Wednesdays. TLC follow the JCPS calendar. When school is not in session on Tuesday or Wednesday (e.g., snow days, vacation days, professional development, parent-conference days), TLC is cancelled also. The Learning Center is free! Elementary students in the regular classroom setting from Middletown or Jane Hite Elementary whose teachers, administrators, and/or the Family Resource and Youth Services (FRYSC) coordinator feel will benefit from the TLC program. TLC will provide transportation from the school to Middletown Christian Church. Parents or guardians are responsible for picking their child up from Middletown Christian Church. The legal parent/guardian will need to complete the registration paperwork that is available through the Family Resource Center director at Middletown or Jane Hit Elementary School. What will my child do during a TLC session? Upon arrival at TLC, students will receive a light snack as they converse with mentors. Does my child need to bring anything to TLC? Yes. Students need to bring a good attitude, a willingness to participate in literacy activities, and their backpack with the student’s homework, if applicable. TLC provides materials and supplies to engage students in learning activities.